Citrix XenApp Policies are settings for XenApp servers; for example, they can be rules that govern user connections and server settings, etc… Below are some facts about Citrix XenApp 6.5 Policies. There are two types: Computer Policies and User Policies. There are different 7 templates as well which cannot be edited. Found under: AppCenter -> Citrix Resources -> XenApp -> Policies. Examples: DNS Resolution and Display Memory limit policies. Policy that has Higher number is Less Priority. Example: to enable Memory Optimization Policy: Under Computer Policy, there is an Unfiltered template. Click Edit. Click Settings. Click Memory/CPU. Click Add near Memory Optimization. Click Enable. Click OK when done. This action enabled the Memory Optimization for the server to optimize memory usage by creating shared DLL on similar apps. Try to create a new Policy called MyPolicy and enable Connection Reconnection. Apply Filter to the Workergroup you created. WorkerGroup: group of XenApp Servers that have similar apps on them. To Save a Policy: Highlight Policy and choose Actions drop-down menu. Save it as template (backup / restore purposes). We can use default template and/or customize it to suite our needs. For instance, we can customize by removing some settings. Cache data acts as branch repeater. We can create Policies in GPMC or in Citrix console AppCenter. CPMC -> Citrix Policy -> You’ll see same policy management Console. Settings are under user or Computer Configurations. 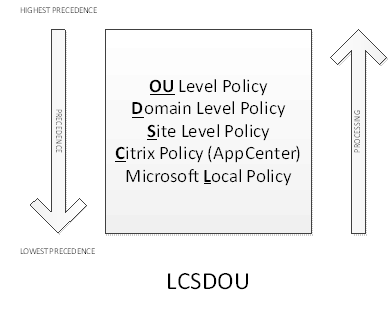 Recommendation: Apply Policy in XenApp, AppCenter. Keep it in one place only for simplicity. If we make a policy in XenApp, it will not appear in AD. That’s why we need to keep it in one single location. Run for Objects such as users. Find out what gets applied to which. In Command Prompt, type GPMC.MSC, R/C Citrix Group Policy Model. Then run the Wizard. Specify User/Computer/OU information. Click Next. Here, you can Filter Evidence Selection by inputting the IP address, Client name,, server group. Measure load of servers. This is for Data Collectors to know. Two default LE. You cannot change these LE. At 10%, it is considered as NO LOAD. Load throttling: The impact of logons on load is HIGH. Memory Usage: same as CPU utilization; that is: 90% is considered FULL and 10% is considered LOW. We can create Custom Load Evaluators. Scheduling: when users can log on. This is determined by the time you buy the product. No restrictions on the number of XenApp Server. LE can only applied to servers, not users or apps??? Load Evaluator is more like local than Zone. Specify multiple WG for failover. Please go through all the policies to make sure you understand them properly. Magnificent web site. A lot of useful information here. I am sending it to several friends ans also sharing in delicious. And obviously, thanks for your sweat! I hope to add more contents often. Enjoy!